I'm not sure we've ever met any group more dedicated to their cause than the Mother's of Marines (M.O.M.)! We were strategically ambushed with an avalanche of phone calls demanding we put aside our popular Army, Navy, and Air Force Gnomes and make room for a New U.S. Marine Corps Gnome! We initiated an immediate production and we're thrilled to carry this new marine gnome thanks to your diligence. 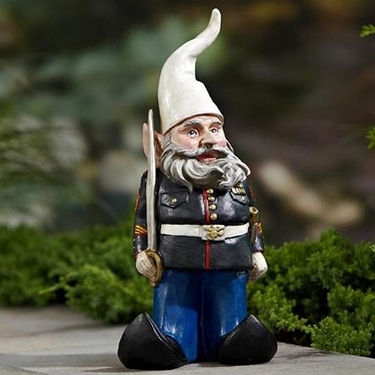 This military garden gnome is now in stock and shipping! Size: 14" Tall, Cast Resin.